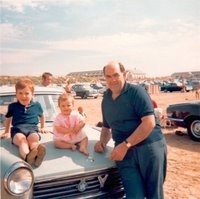 I've fond memories of the Morris Oxford dating back to the classic photo of me and my sister sitting on the bonnet of dad's Mk V on Southport beach back in 1970. I turned 40 in January 2005 and decided to have my mid-life crisis in an Oxford instead of on a Harley-Davidson! I spent 3 months looking for something that didn't need anything major doing to it, and finally found her 60 miles away in Prestatyn, North Wales. 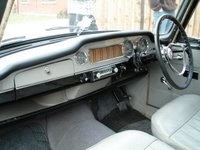 She's a 1970 Series VI automatic, in Connaught green with cream interior, 91,000 miles recorded and two previous owners. She'd just passed her MOT, which was reassuring, but after the test drive a small hole appeared in the manifold, emitting puffs of white smoke. The owner agreed to get it fixed, so we shook hands on the deal and I arranged to come back the following week. After spending the week like a child waiting for Christmas, I caught the train to work (first time in 20 years!) and a colleague gave me a lift to Prestatyn on his way home. "Betsy" was waiting for me with a full tank of petrol and a tidy weld plugging the hole in the manifold. I set off home with daylight fading, rain falling and my heart in my mouth - waiting for something to go wrong. But she was fine - a nice steady 55mph on the motorway, keeping up with the Asda lorries and I began to enjoy myself. Just over an hour later I was home. I parked and went to open the garage doors. When I got back in she wouldn't start and struggled to turn the engine over. I tried a few times but it was obvious she wasn't going anywhere. I had just discovered the dreaded combination of a puny dynamo and an old under-rated battery! The journey home with full lights, blower and wipers had finished the battery. Even an overnight charge wasn't enough to bring it back to life. Next day my local branch of A.T.S. declared it dead and furnished me with a beefy new battery for £55 - I was back on the road and ready to make my list of jobs to do.